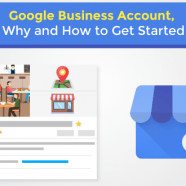 Why does every local business owner should own a Google business account? Google has its presence in every premise of the digital world. That’s a fact that we all know. As a business owner it is vital to be aware of the effect that Google can have on your business. Why not lend the power of Google to give it a little push? Now, let’s say you wanted to look for a nice cafe near you to have a cup of coffee. Would you Google it? The answer is most probably yes. You can also ask your friends. However, the search engine would definitely give you the quicker answer. What’s more, address, opening hours, phone numbers, photos of the premise and even customer reviews will be in your palm the moment you tap on the cafe of your choice. Super neat right? I myself based my shopping and dining choices on local business listing most of the time. Especially when I’m in an unfamiliar area. When a store offers all the information I need with a tap coupled up with good reviews, you can bet I’ll pay it a visit. If you haven’t tried googling your own business, I suggest you do it right now. If it doesn’t appear on the Google business list, imagine all the potential customers that you’ve lost . Create a business account on Google is a good idea. That is the first step to get your business listed on Google search page. However, if your business does appear in the search result, claiming that as yours and start managing it will be a good step to take for your business. It is a powerful tool where you can manage and profile your business across Google. It’s also free. All those information of all those cafes that appeared on a search result? That’s Google My Business’ working. Open up that Google map, zoom in to your current location. Those businesses and public locations you can tap on and get their information at a glance? That’s also Google My Business’ working. Basically, you have the power to control how you want your business to appear on Google (more or less). You will have the ability to edit your listing. From operating hours to what kind of amenities you provide. Google My Business will also lend you tools. Use them to keep a tap on your profile. You can see how people found your business: whether they typed in the name of your premise directly, or they made a “…near me” search where your business popped up. This is only one of the many data that Google can gather. Other useful information includes: how many users visited your website, how many of them requested direction to your premise etc. All these data is important to understand user behavior. Take that into consideration. Plan your marketing strategy accordingly. Couple up with Google AdWords and Google Analytics you can definitely have a bigger outreach. Now, if you agree with me that having a Google business account is important. Let’s get started. First and foremost, you will need to have a google account. If you don’t, sign up for one. It costs nothing. Click here to get an overview of the whole Google My Business package by yours truly – Google itself. Now, click again on that green start now button to get to the fun parts. First and foremost, type in the name of your business. Take in mind that you would want to insert the name exactly as it appears on your physical premise. You don’t want people traveling to your location for a visit on Bloom Florist and Gifts but got confused because on the signboard it simply says, Bloom. Next, type in your address the exact same way you have it printed out on your business card, or listed on your website, yelp, or foursquare etc. If you don’t, it will be confusing to your potential clients and also Google itself. If Google is confused, you’re not gonna get on that search list. Not getting on that search list; not getting that business. Here’s an important little tip. At the bottom of the page, there will be a tick box that says I deliver goods and services to my customers. If you provide services such as piping, gardening or pest control a.k.a the kind of services that require you to be personally present at your client’s location, tick that box. If you provide food delivery, gift delivery etc also tick that box. After that there will be another option to hide your address. DON’T tick this if you have a brick and mortar front where transactions can be made. A map will appear where you can pinpoint your exact location. This will be helpful for customers who rely on GPS to reach your location. Make sure it’s correctly pinned yourself because Google could mess it up in a few meters radius. Later, you will be able to set up your radius of services. Moving on, you’ll be asked to choose among an intensive list of categories where your business falls in. For example, are you a florist, a wholesale florist or a flower delivery. Choose it accordingly, what you can provide and what the customers will need should be taken into consideration. Be specific is better than being vague. After that, you have the option to input your phone number and website URL. Those are great ways for customers to get in touch with you directly. Although Google says it’s optional, make sure you fill it up. Google will ask to keep you up to date and send you some tips from time to time. Yes or no, that’s your own free will. Lastly, Google will need you to verify that you really do own that business premise. You can get an automated call to the phone number you’ve listed or a mail being sent to your shop lot’s address. Both ways can get you a verification code to make sure you’re the legit owner of the business. Now that you’ve successfully set up your Google My Business account, you can go ahead and manage your free website, profile, reviews etc. Visual is important. Update photos of your business on Google. That would definitely help. Keep in mind, if you haven’t verified your business, you have no control over the listing. Signing up only takes minutes, while the verification process could take a couple days. At the end of the day, a little effort goes a long way. 1. Click start now on Google My Business homepage. 2. Type in the exact name of your business. 3. Type in your address the exact way it appears on your business card or your website. 4. Tick or untick the box “I deliver goods and services to my customers”. If you do, follow from step 6, otherwise skip step 5 and step 7. 5. Tick or untick “Hide your address”. 6. Pinpoint your exact location on Google Maps. 7. Tick your choice of delivery and type in information regarding service area. First of all, to make it to that search list you have to be active. Interact with your customers often. Make sure to post at least weekly. Posts are like the window of your storefront. Show them the latest batch of roses that you have in. Post on that Valentine’s promotion. Treat it like how you would on your shop window to grab attention. Reviews is another important aspect. Made it known to your visiting customers that they can leave a review for you on Google. Be responsive to reviews to showcase good customer service. If you got a bad review, say sorry and ask how you can do better. If you got a good review, thank them and welcome them for another visit. Be genuine in your interactions. Don’t leave a generic thank you for every review. Google likes it when there’s real communication. What I find charming from these little interactions is when the business is being genuine and real. Owning up to your own little shortcomings is better than sweeping it under rug. One more simple trick. Make sure your business is also listed on websites other than Google. Let’s say you have your own company website and a Facebook page. You can do more by listing your business into reviews and check-in websites. For example Yelp, Foursquare, TripAdvisor etc. As mentioned before, you can link users to your business website. It is important to make sure your website is optimized. One of the simple SEO steps includes using keywords. LSIGraph is a great website to check for related keywords. Having multiple thematic keywords on your website can make it more relevant to Google. Another way to SEO your website is via schema. This ensures your website is giving all the correct signals and direction to Google. Make sure that your html is clearly tweaked. I repeat, if Google is confused, you’re not gonna get on that search list. 2. Be responsive to reviews. 3. Be genuine in your responds. 4. Get your business listed on sites like Yelp, Foursquare etc. 5. Optimize your website utilizing LSIGraph and Schema. Google’s influence is bigger than ever. Utilize Google My Business to gain more exposure. It’s free! Be consistent with the info you put online, treat it like how you would your actual store. Be responsive, interactive, honest and up-to-date. Get featured in multiple review or check-in websites. Lastly, seo your business homepage. Do all that and you’ll have a bigger chance to get listed at the search front page!